Why test the new PAK FA in 2018? The new engine of the PAK FA will only be tested as late as 2018 because there are difficulties in conducting the bench testing. However, the country’s defence capability will not be affected by this delay, say analysts. The second stage of testing the engine for the newest front-line fighter, the PAK FA, has been delayed by a year. The aircraft will now fly with the new engine only in 2018, and not in 2017 as originally planned. The technical complexity of this project requires a long bench-testing period for the new engine, further delaying final completion date of the fifth generation fighter programme. Vladimir Prokhvatilov, expert at the Russian Academy of Military Sciences, said the engines “will be brought to a fully operational state no earlier than 2025”. Today five prototypes of the PAK FA are flying using engines of the first stage; the AL-41F1. These are capable of developing a thrust of 86.3 kN, and 147 kN in the afterburner mode, but this does not meet the requirements of a fifth generation fighter, or the thrust-weight ratio, or fuel consumption requirements. The second generation engines will, in terms of fuel efficiency and thrust-weight ratio, be much more effective than the predecessors, and will achieve full compliance with the technical criteria for fifth-generation engines. This will ensure that the T-50 can achieve supersonic cruising speeds without using afterburners. Postponing testing for the second generation engine will affect the completion schedule of the entire PAK FA program, but analysts do not think this would pose any serious problems. “The Su-35s that are now entering active service in the military – are already almost fifth generation fighters, and these can be used for a long time,” RIR learned from Vladimir Shcherbakov, deputy chief editor of Vzlyot (Take-off) Magazine. A shift “towards the future” of the PAK FA program will not affect the country’s defence capabilities, said Shcherbakov. “We must not forget that we have had a curtailment of spending – for now the state budget cannot handle the previously set amounts for national defence purchases. The Americans have also significantly reduced their purchases of Raptors (F-22s) – which are too expensive, and there is no strong opponent in existence,” said Shcherbakov. 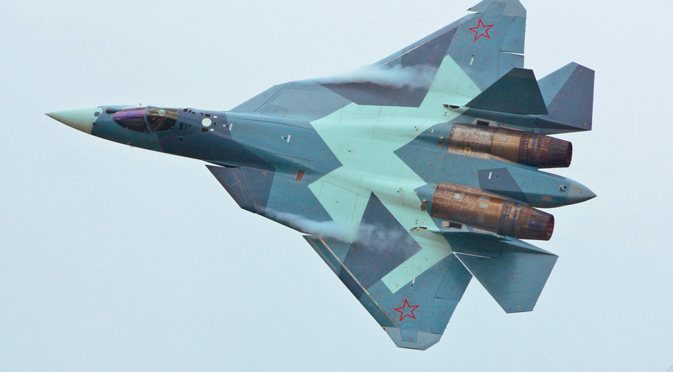 Capacities focused on producing the PAK FA will not remain idle. The Defence Ministry will provide them other orders. These factories are already assembling 4+ generation aircraft. The signed state contract, concluded in August 2009 between the Russian Defence Ministry and the Sukhoi Company states that the Russian Air Force should receive 15 new Su-35S in 2015. PAK FA is a heavy fighter jet, with a special aerodynamic configuration of the airframe. The skin consists of 70% composite materials, and its weapons are stored inside the fuselage in order to reduce radar visibility. Byelka Radar, equipped with active electronically scanned array (AESA), allows simultaneous tracking of 4 surface and 30 air targets, and firing on 8 of them.